This footage from a Go Pro Camera attached to a rocket launched into space is incredible! 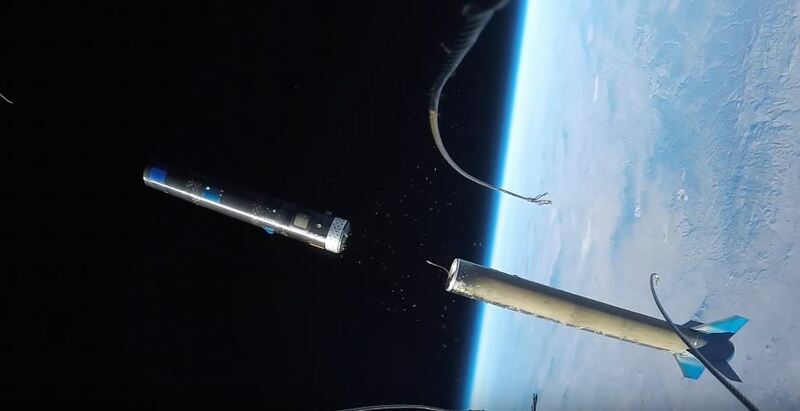 The footage which was filmed using a Go Pro Hero 4 camera attached to an SL-10 rocket which reached an altitude of 396,000ft (120,700 meters) and speeds up to Mach 5.5 (3800mph or 6115km/h) at engine burnout. Can you really appreciate Earth when you are standing there and watching the sky? Perhaps, but the best way to see and feel how important and beautiful our planet is, is definitely from above, and what better perspective than this one captured by a GoPro camera which shows a crystal clear view of our planet, its atmosphere, and SHAPE ? The image, photographed by Astronaut William Anders displays one of the most beautiful images of our planet, the first color image of the Earth from space. Now, nearly fifty years after the Earth Rise image, more and more images of our planet show what a beautiful home our world is. There are several videos from space that show us how beautiful our planet is. Most of them are from NASA or other space agencies around the globe, this video footage was filmed in 2015 when a 6 meter-tall SL-10 rocket was launched into space with a Go-Pro Camera attached to it. On November 6th, 2015 UP Aerospace Inc. launched the 20-foot (6-meter) tall SL-10 rocket into near-space. The mission: deploy the Maraia Capsule testing the aerodynamics and stability of the payload on re-entry to the atmosphere. The rocket reached an altitude of 396,000ft (120,700 meters) and speeds up to Mach 5.5 (3800mph or 6115km/h) at engine burnout. Space is beautiful, and this view from Earth is beyond stunning. Earth is unique in many ways, and this video proves it. But, it is special not only because of its beauty but because of its characteristics that make it so far—the most important place in the universe—since it is the only planet that can support life—as far as we know. Earth is the only planet with an atmosphere containing up to 21 percent of oxygen, it is the only inner planet of our solar system that has one LARGE natural satellite. Check out the video, sit back and enjoy!